Kashmir Cotoneaster is a low straggling or prostrate shrub with small leaves up to 1.3 cm, which are rounded to broadlly elliptic and with woolly or shaggy hairs beneath, but becoming hairless. 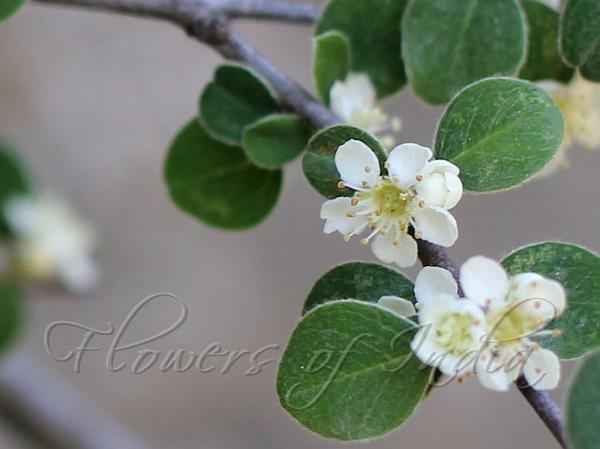 Flower clusters are very short, with 2-5 white flowers with petals 2-3 mm. Fruit is black. 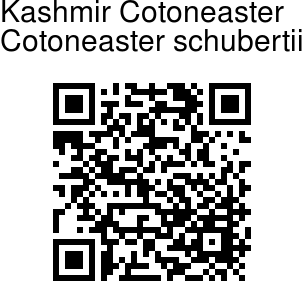 Kashmir Cotoneaster is found in Kashmir and Pakistan. Flowering: April-May. Identification credit: Suresh Rana, J.M. Garg Photographed in Paddar Valley, Jammu & Kashmir.